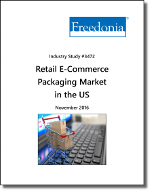 US demand for retail e-commerce packaging is expected to expand 8.6 percent yearly to $3.7 billion in 2020. Protective packaging, boxes, mailers, labels, tape, and insulated shipping containers are the major types, with boxes, labels, and mailers poised to register the fastest gains. The largest market for e-commerce packaging is traditional e-commerce retailers, dominated by Amazon. In terms of merchandise applications, computers and electronics, apparel and accessories, and home furnishings are the leaders, with apparel and accessories projected to be one of the fastest growing applications. The study provides historical data (2005, 2010, 2015) plus forecasts for2020 and 2025 for e-commerce packaging demand (i.e., consumption) by product, market, and merchandise application. In addition, key strategic variables affecting the industry are discussed, company market share is evaluated, and key industry players are identified including Georgia-Pacific, International Paper, Intertape Polymer, Packaging Corporation of America, Pregis, Sealed Air, 3M, and WestRock.